Available for all varieties of works for the stage and screen. Theater, dance, music, and movies can be presented in the 85 - 130 seat venue. Alternative seating configurations are available to present theater in the round or with a thrust. Audition, rehearse and stage a theatrical production. Film and/or screen a cinematic gem. Let loose the musical genius from within. The Tenth Avenue Arts Center can help you get those creative ideas to your adoring public. 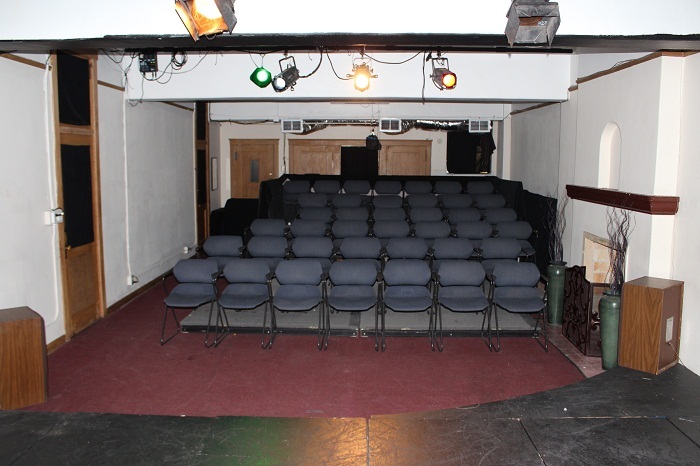 An intimate 40-seat venue ideal for smaller productions, staged readings, workshops, movie screenings, auditions, and rehearsals. The Forum Theater can also serve as a place to gather for discussion groups and community meetings. The Top Of The Tenth is a captivating rooftop setting surrounded by the beautiful back drop of the San Diego city skyline. The Top Of The Tenth is available for a wide variety of activities. Receptions, fund raising events, parties, concerts, plays, and cinema under the stars are but the tip of the Top Of the Tenth’s potential. Celebrate life’s achievements from high atop the Tenth! 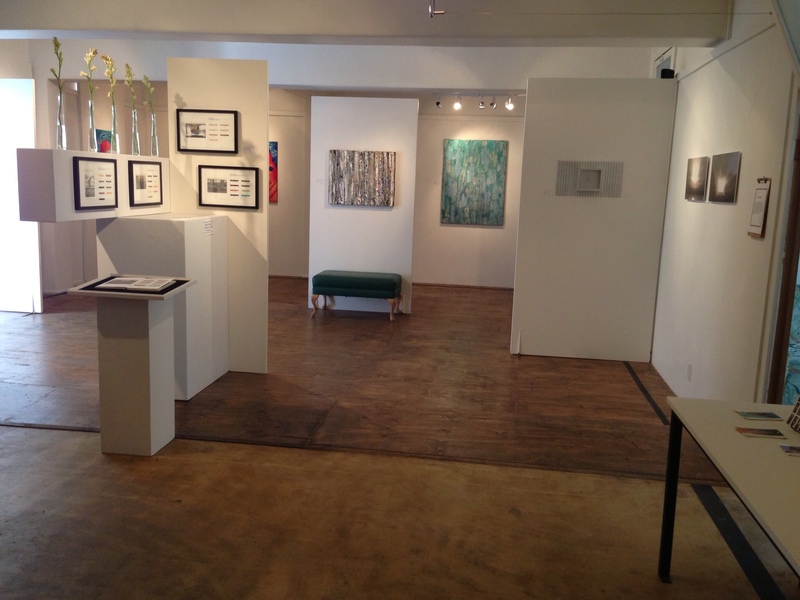 Present your own art or collaborate with a group of artists and showcase your original creations in the spacious setting of the Tenth Avenue Art Gallery. 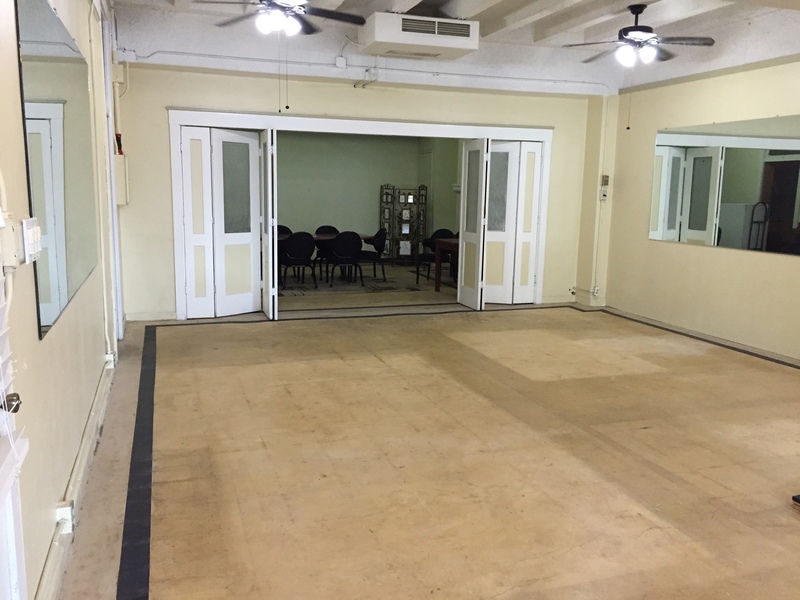 Rehearse your next production and/or hold your latest auditions in the spacious rehearsal hall at The Tenth. Monthly, weekly, daily rates available. Also a great space for an art installation, small concert, movie screening or conference. email The Tenth at info@tenthavenuearts.com. 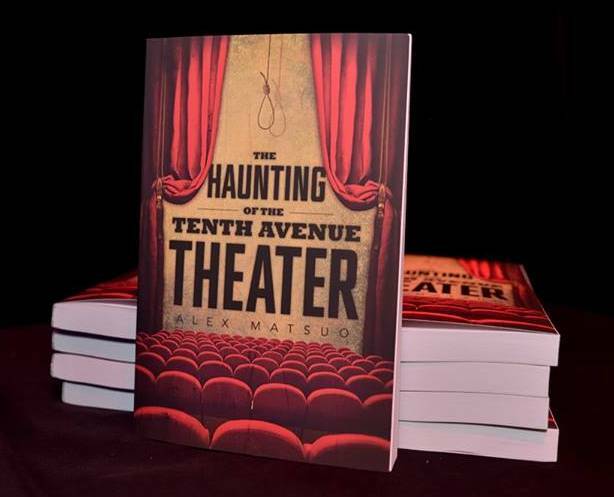 As of this writing, four spirits are known to reside at the Tenth Avenue Arts Center at 930 Tenth Avenue in downtown San Diego. To know the ghosts at The Tenth, one must have some knowledge of the history of the site. The First Baptist Church was the original owner of the building. Since the 1800's, the First Baptist faithful worshipped in the large church next door (south) to the building that now holds the Tenth Avenue Arts Center. Now that there is somewhat of a back story of the site, the history of the ghosts of the Tenth makes some sense. When the doctor returned to port in San Diego he set out to fulfill his solemn tradition of praying for the souls of his fallen comrades. He did this at the chapel of the First Baptist church. He gave church officials the following account. He reported that he entered the sanctuary and sat down in a pew at the back row. He knelt to pray and was suddenly rocked backwards against the pew. As he gazed to the ceiling with his eyes and mouth wide open, he felt that same odd sensation that he experienced back at the field hospital on Okinawa. A church official found him slumped to the floor and unconscious where he had been kneeling. It seems as though the spirit of the British Lieutenant had entered the doctor's body back in that hospital and was now free and had taken up residence at 930 Tenth Avenue. The Lieutenant has never been known to be frightful or mean. He seems to be content with his home in the building, but has been known to get a little testy with those who have been heard speaking ill of subject matter related to the United Kingdom. 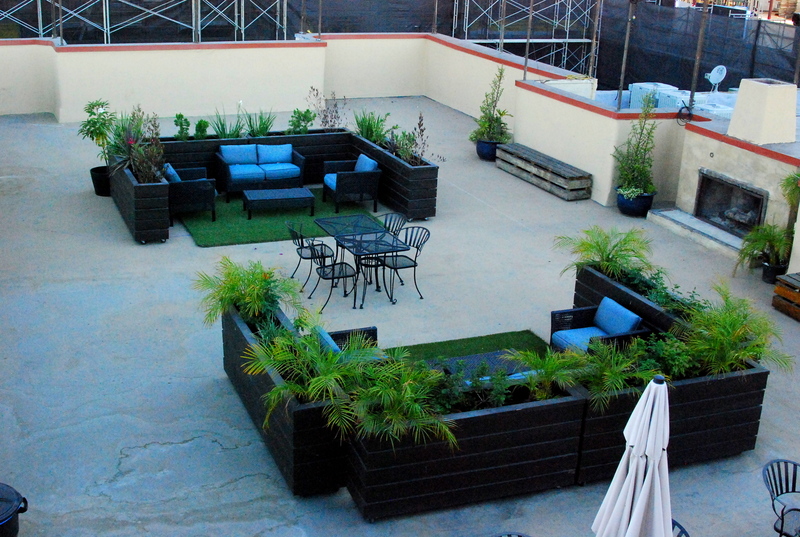 When the building was occupied by the First Baptist Church, the rooftop was used for a variety of outdoor activities. The church surrounded the roof deck with a chain link fence and installed chicken wire over the top of the court to keep any stray recreational equipment from falling to the streets below. The church youth took advantage of the great downtown playground for such games as basketball, badminton, volleyball, and shuffle board. On one particularly hot day in October, a girl named Missy had had enough fun on the roof and wanted to go back downstairs to get out of the heat. The pastor supervising the handful of kids on the rooftop reassured Missy that right after the current basketball game ended the group would be going down to the social hall on the second floor for refreshments. Missy was a bit of a precocious child and didn’t feel comfortable with that time frame so she bolted for the staircase. On the morning of Monday, November 25, 1963, the church secretary unlocked the front door to the church and proceeded up the stairs to her mezzanine floor office. She was still thinking about the inspirational sermon the pastor had given the day before. He spoke beautifully about the need to be strong after the horrible assassination of President John F. Kennedy that had occurred on Friday. The secretary put down her purse and knocked on the pastor’s door. There was no response. She walked back down to the first floor and entered the sanctuary and called out for the pastor. She noticed a dim light glowing from a cloak room on the side of the alter. Thinking that the pastor was organizing the choir robes from the day before, the secretary walked down the side aisle of the large chapel and called out to him. She entered the small room and uttered the pastor’s name again. Suddenly she recoiled in horror as she stared up at the dead body of the pastor hanging from a storage loft access ladder. It is presumed that the pastor had gone to try and apologize to Missy for causing her premature death. Little did Mr. and Mrs. Lorac know that christening their baby with the name “Carol” (thus creating the clever palindrome Carol Lorac) would result in a lifetime of strife and agony. Mind you it’s not a palindrome on the level of- 'Eva can I see bees in a cave?' Still the Loracs were proud of their effort. Who knew that an act as benign as giving your child a name spelled the same forward and backward would be a tragic mistake. That seemingly innocent gesture planted the obsessive notion in Carol that everything in her life had to be in perfect order. Yes, that innocent naming created an obsessive-compulsive disorder of the most extreme nature. Carol was a member of the First Baptist Church that occupied this building. Fellow parishioners were graciously tolerant of Carol’s obsessive ways and though, at times, her behavior was tedious they made her feel at home with in the group. Her fellow church goers patiently coped with her incessant straightening of their articles of clothing that might be slightly askew or her demands that people sit in alphabetical order. That being said, there were some advantages to having an OCD person in the ranks. The church was always kept in pristine condition. Choir robes were always well organized. Hymnals were continually arranged by color and size. One particular issue that Carol could not correct was the errant rehanging of a bathroom door stall. All the doors on the bathroom stalls in the building swing into the stalls. For some reason, a repair man mounted a third floor bathroom stall door to swing out. When Carol noticed this error she demanded the repairman fix it. The man refused. Carol went to the Pastor with her complaint. The Pastor investigated and was not too concerned with the mistake. He truly was not interested in spending church funds to have the door rehung. He tried to be as persuasive with Carol as possible but she would have none of it. The issue would grind at her obsessive nature until her dying day. Most, if not all the congregation attended Carol’s funeral (held right here in this building). They were kind to her to the end. There was undoubtedly relief for Carol when she finally left this world. However, it has been reported that her spirit remained in the building still bothered by the stall door. It has been said that she inhabits the bathroom stall with the errant door. It’s as if she is waiting for the repairman to return. Her spirit is in the stall or in the little passageway between the men’s and women’s bathrooms. Mysterious complaining noises emanate from that narrow space. More research is pending on the existence of these four spirits at The Tenth. As more information is gleaned from the building we will be posting it here.